I’ve often shared information here that notes 40% of Detroit households have no access to internet, both broadband and cell phone access. In a city that faces countless issues with connectivity and communicating with pockets of people spread across a large area, there is great potential for internet to bring Detroit together, improve communications, and equalize access – jobs, education, resources, etc. The latest numbers from the 2014 American Community Survey show Detroit has 95,825 households or 37% of all Detroit households have no internet access. The city sadly ranks #2 nationally for cities with over 50,000 households. 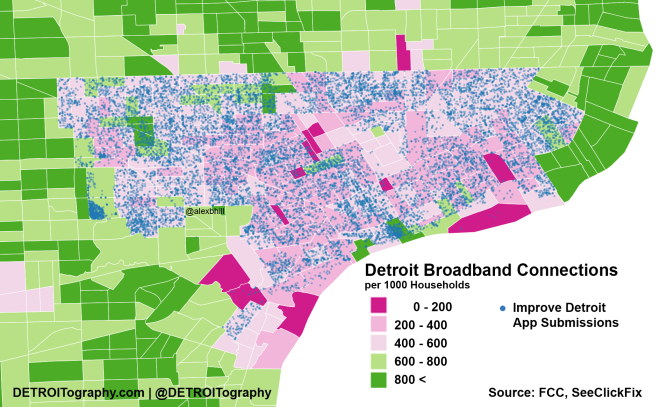 The logical next step in saying that 37% of Detroit households have no internet is to then ask where are those households located? Who is impacted? Previous Previous post: Map: What is Greater Downtown Detroit?